The TechTestJr exams for 2017. I wanted to update you guys about our performance this past weekend at the NorCal Regional Championship. Since Intel, we’ve made a lot of improvements to both autonomous and the launcher to increase the robot’s consistency. With these upgrades, we performed well in the qualifying rounds; in our last match, our alliance scored 205 points before penalties. Nevertheless, we faced some difficult opponents and were ranked 10th with a 3-2 record going into alliance selection. Unfortunately, we were picked by a poorly performing team to be a part of their alliance. Despite some close matches (we lost by only 9 points to the best team at the event! ), we lost in the semifinals. However, after watching the remaining matches with disappointment, we received the Motivate Award! Although normally not very coveted, this award qualified us for the West Super-Regionals, the next level of competition. This event includes a total of 72 teams from the 13 westernmost states and will take place March 10-12 in Tacoma, WA. To help fund our trip, we’ve started a new wave of fundraising. We have a GoFundMe page (https://www.gofundme.com/acme-robotics-superregionals-trip), and a PayPal donate button on our website (http://goacmerobotics.com). We’d really appreciate it if you could spread the word. As the competition is in three weeks, we’d like contributions as soon as possible. On a Sunday morning, the Folsom Intel campus parking lot was quiet, just a few vehicles scattered across the tarmac. My wife Ellen and I had come to observe the Velocity Vortex robot competition sponsored by Qualcomm and supported by Intel. Two competitors who are working together to promote STEM education opportunities for students. As we approached the FM-7 Cafe, through a Courtyard, we could hear the rumble of voices spiked by cheers. Opening the Cafe door, we could feel the energy in the room roll over us. To our right were students cheering four robots, two red and two blue engaged in combat to see which team could score the most points. To our left a sea of tables with young men and women fine tuning their robots, and charging batteries, as they waited for their turn on the scoring field, a 12 x12 foot instrumented open box with 1-foot high plastic walls. We were fortunate to find some front row seats, in the staging area where the teams wait their turn in the scoring box. This position allowed us to examine the robots and their creators up close and still see the action in the scoring box on a large projection screen. We saved some seats for fellow Sierra Economics and Science Foundation Board member George Rebane and his wife, Jo Ann. We had come to cheer on the Nevada Union Team, Acme Robotics, lede by Ryan Brott, one of the students in the SESF TechTest Mentoring Program. Shortly after George and JoAnn arrived the Acme Robotics team brought their robot 8367 to the staging area, and we were soon surrounded by the supporting parents, grandparents, and the team’s mentors Mike Oitzman and Michael Lewis. Looking at the scoreboard it was clear 8367 was a strong competitor, having already won some of the early preliminary rounds of the competition. At the end of the qualifying rounds robot, 8367 was #2 on the leaderboard. There are two phases in the live competition. The first phase is 30 seconds of autonomous operation, where the robot is controlled by onboard intelligence, followed by the controlled phase, where the robot is guided by an operator with a video game controller connected to an Android cellphone which was communicating with the onboard Android Phone. The competition is more than robotic combat on the scoring field. As Mike Oitzman explained, the competition was set up to mimic a company start-up, where the students had to build a team, develop a plan, seek out funding sponsors, design and build their robot, and then develop a competitive strategy. Part of the evaluation is an assessment by the judges for the team demonstrating effective teamwork, creativity, good engineering practice and have a robust community outreach program. The NU Acme RoboticsTeam, includes hardware, software, marketing skills. While this was clearly a team effort to win a spot at the regional finals, the autonomous routine written by Kelly and Ryan was a major factor in winning more matches than the competition. They developed software that enabled the robot to position itself autonomously to capture the beacons on two sides of the scoring box. Ryan said that mentoring by George Rebane, SESF Director of Research helped him to “gain some valuable insights” into robotic operations. We could not stay for the final phase of the competition, leaving at the end of the qualifying rounds. The NU Acme Team finished the qualifying rounds in 2nd place and moved on to the semifinals. The Regional Championship will be held on March 22rd – 25th, 2017 at the ARC Pavilion on University of California (UC), Davis campus. They expect 55 teams to compete, with over 2000 observers. Ellen and I are planning to be in the crowd, cheering on the NU Acme Robotics Team led by Ryan Brott, an SESF mentored student. TechTest2016 Winners with their Quad-Copter and Programmable Robots. On May 19th, the top 7th and 8th graders in the area gathered at Telestream in Nevada City, to participate in the fifth annual TechTest Jr, a math and science competition sponsored by the Sierra Economics and Science Foundation (SESF). A total of 41 students (26 girls and 15 boys) from 9 area schools, including Magnolia, Seven Hills, Mount St. Mary’s Academy, Lyman Gilmore, Forest Charter, Chicago Park, Weimar, and Grass Valley Charter, competed for STEM prizes that included quadcopters and a variety of programmable robots. TechTest Jr is a math/science exam primarily for high performing 7th and 8th graders. It focuses on problem solving skills. The purpose is to provide students an opportunity to demonstrate their proficiency at applying math, science knowledge and problem solving. It’s intended to promote the development of critical thinking activities in the County and to help prepare students for future exams of this type, such as the SAT and ACT and the TechTest Merit Scholarship program, also sponsored by SESF for graduating high school seniors seeking STEM careers. This year, holding the event at Telestream, showed students the type of opportunities that lie ahead of them as a result of their proficiency in math and science. Telestream and Anna Greco, VP of Client Services Enterprise Products were fabulous hosts to the students, providing tours of their facility, showing product demos and even livestreaming the event and student interviews to their Facebook page. The exam consisted of 33 challenging math and science problems. The students had almost two hours in which to complete the test. More details posted under the TechTestJr Navigation tab above. The winners and prizes are shown under the TechTestJr navigation tab above. The Keynote speaker will be Joel Kotkin, who wrote an article in Forbes calling out the top 15 communities for job creation. Attendees will learn why he chose these communities. From the ERC webpage: WHAT IS THE SUMMIT ALL ABOUT? Like many other cities and counties across the U.S., in the Sierra Foothills region discussion among government officials, community leaders, media representatives, and businesses about economic development and job creation has become an increasingly important topic of conversation. A number of small to medium sized communities across the U.S. are poised for success. They represent “the major leagues”. Our Summit Keynote Speaker Joel Kotkin recently published a feature story in Forbes Magazine highlighting the Top 15. In his keynote presentation you will learn why he called out these communities. Immediately after a panel of leaders representing some of the most notable success stories – Asheville, Austin, Boulder and Bend — will share steps taken by local business, civic and education leaders that are helping them “win the jobs war”. 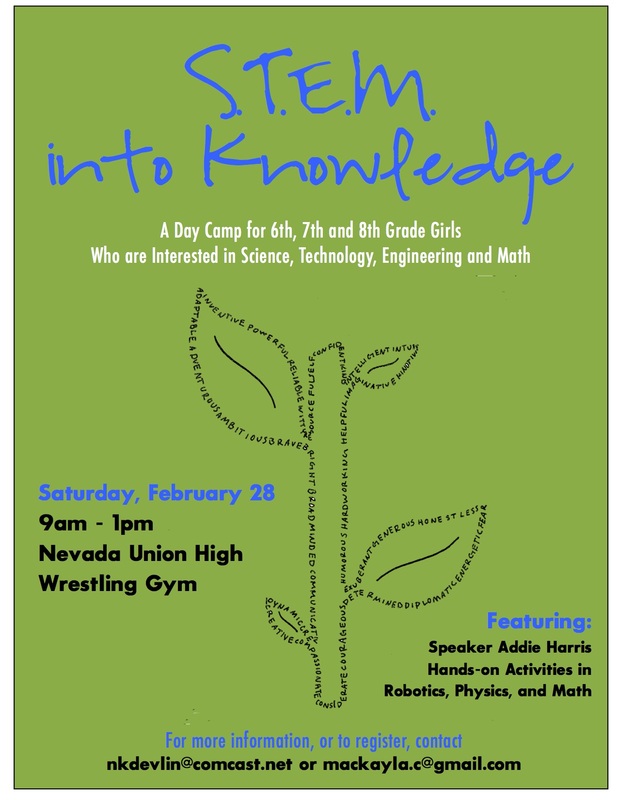 The Nevada County Board of Education is sponsoring a A Day Camp for 6th, 7th and 8th Grade Girls who are Interested in Science, Technology, Engineering and Math. SESF strongly supports STEM education opportunities for all Nevada County students.